Justice, or rather justesse, the act of adjustment, suspension of all action pending decision; in material matters, may refer to law suits or prosecutions. Socially, marriage or marriage agreements; politically, treaties. The Daughter of the Lords of Truth. The Ruler of the Balance. This letter Lamed means an Ox-goad or a Whip, and would suggest such a translation by its shape alone. 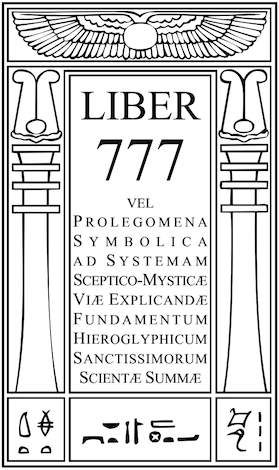 Its astrological sign Libra, the Scales, is its most important attribution and sums up the characteristics of the Path. 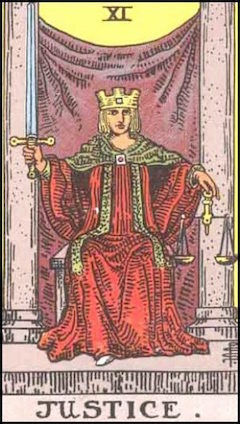 The Tarot attribution is XI -Justice, depicting a woman, very sombre, seated between two pillars, holding a Sword in one hand, a pair of Scales in the other. Its subsidiary Tarot title is "The Daughter of the Lords of Truth. The Ruler of the Balances". The Greek God is Themis, who, in the Homeric poems, is the personification of abstract law, custom, and equity, whence she is described as reigning in the assemblies of men, and convening the assembly of the Gods on Mount Olympus. Its Egyptian God bears out the idea of Justice for she is Maat, the Goddess of Truth, who in the Book of the Dead appears in the judgment scene of the weighing of the heart of the deceased. Nemesis, too, is a correspondence, as she measured out to mortals happiness and misery; and here, too, is the Hindu concept of Yama, the personification of death and Hell where men had to expiate their evil deeds. The plant of Lamed is Aloe; its animals the Spider and Elephant; its perfume is Galbanum, and its colour Blue. Its Yetsiratic title is "The Faithful Intelligence". A knight with a lance and banner, with a serpent. (1) Thrush. (2) Man with sharp sword seemeth to answer in burning ashes or coals of fire. The Daughter of the Flaming Sword.